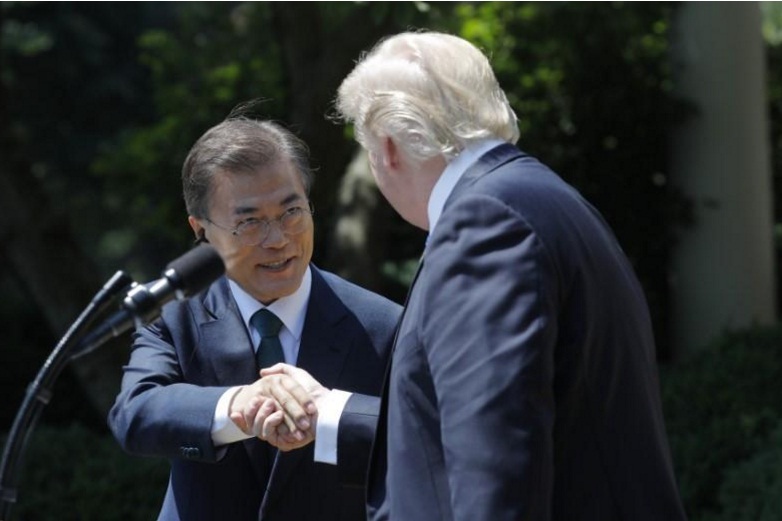 File photo: U.S. President Donald Trump (R) greets South Korean President Moon Jae-in prior to delivering a joint statement from the Rose Garden of the White House in Washington, U.S., June 30, 2017. SEOUL - South Korea’s President Moon Jae-in and U.S. President Donald Trump agreed to exert stronger pressure through sanctions on North Korea following its nuclear and missile tests, South Korea’s presidential office said following a telephone call between the two leaders on Sunday. South Korea’s President Moon Jae-in and U.S. President Donald Trump agreed to exert stronger pressure through sanctions on North Korea following its nuclear and missile tests, South Korea’s presidential office said following a telephone call between the two leaders on Sunday.